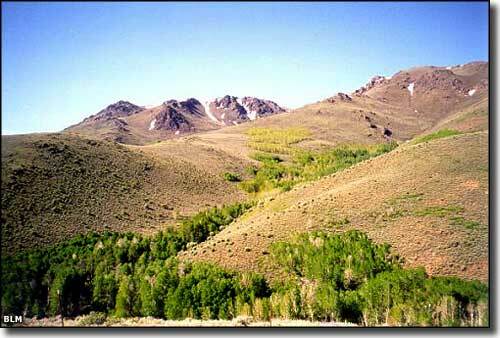 The North Jackson Mountains Wilderness is bordered on the south by the South Jackson Mountains Wilderness and almost on the west by the Black Rock Desert Wilderness. Elevations on this 23,438-acre property range from 4,000' to the summit of Parrot Peak at 8,448'. Most vegetation in the area is sagebrush, with greasewood and saltbrush at the lower elevations and some juniper up above. The wilderness is disected by several deep and rugged canyons, some of which contain streams and riparian areas with cottonwood, willow and aspen. There is enough greenery to support a stable population of mule deer, bighorn sheep, pronghorn antelope, coyote, mountain lion and sage grouse. These mountains are high enough to have possibly been an island in ancient Lake Lahontan. This is part of the Black Rock Desert-High Rock Canyon Emigrant Trails National Conservation Area. Access to the North Jackson Mountains Wilderness is via the Jackson Creek Ranch Road which runs north-south along the western edge of the wilderness. Some folks approach the property by taking the Jungo Road 35 miles west from Winnemucca to Bottle Creek Road. Then they go north on Bottle Creek Road to Trout Creek Road. Bottle Creek Road also approaches the wilderness by travelling south from Nevada Highway 140. BLM Map of the area - 300KB. Upper photo courtesy of the Bureau of Land Management.